The usage of cauliflower in samosa filling always brings out a different flavour & taste. Cauliflower was wintery produce earlier, that’s why this version of samosa was seasonal. 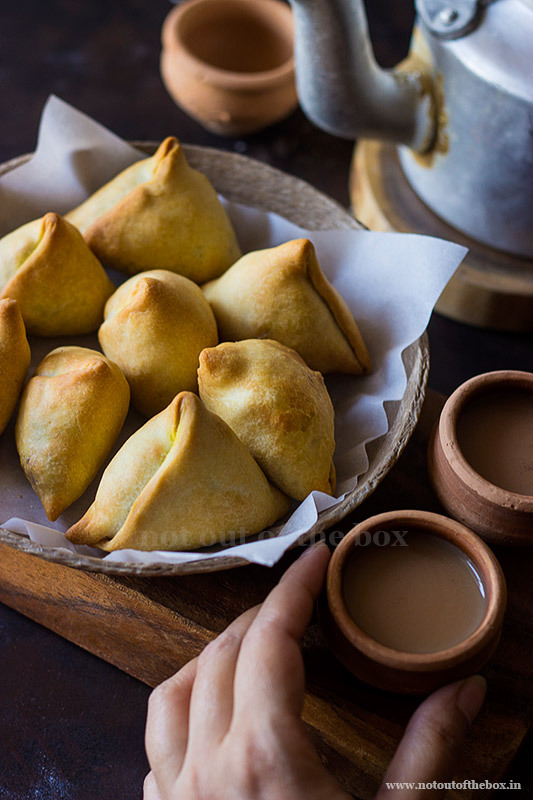 But now we get cauliflower throughout the year, so, roll your sleeves up and make these shop style Samosas at home by following my easy recipe. And don’t forget to share your experience with me. Potato Cauliflower Samosa is one of the popular Bengali snacks. 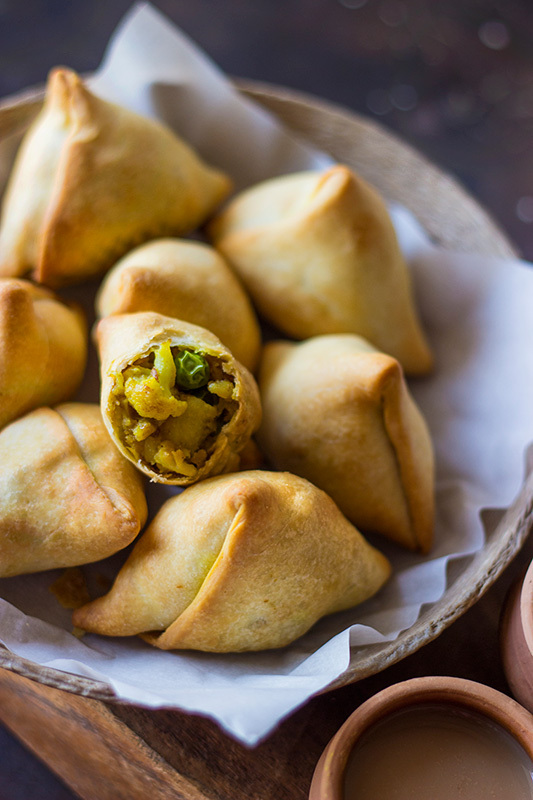 Crisp, golden samosas with the tastiest filling ever make them irresistible. By following this easy recipe now, you can make shop style samosa at home. Dry fry the ingredients over low heat mentioned for ’Roasted Spice powder/Bhaja Moshla’ until one shade darker in colour. Cool the spices and grind to a fine powder using a food processor, keep aside. Parboil the cauliflower florets, drain and keep aside. Heat 1/3 cup of oil in a deep frying pan/kadai, add the florets and fry over medium heat until golden in colour. Drain on a paper napkin and keep aside. Crush the boiled potatoes unevenly, no need to make a smooth mash keep them lumpy. In rest of the oil (3-4 tbsp oil should be there in the pan, otherwise add some more) temper with bay leaves, dry red chillis, and fennel seeds. Next to add the coriander powder, turmeric powder, ginger paste, and salt. Mix and stir over medium heat for a few seconds. Now add the cauliflower florets, green chillies, peas, peanuts, and crushed potatoes. Mix well and cook for 3-4 minutes over medium heat, keep stirring in between. Sprinkle some water so that the mixture doesn’t become too much dry. Cook for a few minutes more or until the raw smell of masala goes. Add sugar, garam masala powder and 1½ tsp roasted spice powder. Mix well, check salt, and cook for 2-3 minutes more. The samosa filling is ready now, discard the bay leaves from the filling, remove from the heat and keep aside. In a bowl add maida, 4 tbsp vegetable oil, and salt. Mix well using your fingers. The flour mixture will become crumbly in texture. Now add water slowly, and knead until smooth, lump-free firm dough forms. Check the Samosa making steps here. Make balls out of the dough (Confused about the size of the dough ball? Check picture for reference). At the time of rolling apply few drops of oil on each ball. Do this for one ball at a time, when you begin to roll. And grease the rolling surface with little oil too; you need to do this every time before rolling each ball. Start rolling evenly; make round shape like roti, keeping in mind that the thickness should be a bit more than our regular roti. With knife or pastry cutter cut the samosa pastry from the middle. Now take one half circled samosa pastry sheet, make a cone shape by joining the two edges. Stuff the potato cauliflower filling inside. Apply little water on the open edges of samosa and seal. Make it sure that all the edges are sealed properly. Otherwise at the time of frying filling may spill from inside into the hot oil, and that can be quite messy. Heat 1½ cups vegetable oil in a deep frying pan/kadai. Fry the samosas (not more than 4 at a time) over medium heat until golden. Drain on the paper napkin. Serve immediately with some chutney or ketchup. If you’re using an air fryer brush all the samosas with vegetable oil before putting them into the air fryer basket. Brush the bottom of air fryer basket with oil. Preheat air fryer to 180 degrees C for 5 minutes. Arrange the samosas into the basket. Bake for 15 minutes or until golden in colour, and they should feel crisp outside when touched. Your delicious Potato Cauliflower Samosa is ready to devour. Serve immediately with some chutney or ketchup. And don’t forget to pair this with steaming hot Chai. Enjoy!